The winner four years ago when at the final hurdle, he beat Germany’s Patrick Baum, as play came to a close on the evening of the penultimate day of action, Saturday 25th August, at the Seamaster 2018 ITTF World Tour Czech Open in Olomouc; Portugal’s Marcos Freitas underlined the fact indelibly that he has every intention of regaining the coveted title. In a contest that ebbed and flowed, he ended the reign of the defending champion; the no.4 seed, he beat Japan’s Tomokazu Harimoto, the no.2 seed, in seven games (11-5, 1-11, 11-8, 9-11, 11-8, 5-11, 11-6) to secure his place in the final. A splendid performance by Marcos Freitas, one in which mentally he proved sound from start to finish, against an adversary from whom we have now come to expect incredible results. Treat every opponent as a player whatever the age, whatever the pedigree but when the opponents is a 15 year old teenager who has caused sensation after sensation; considering the young man as just another adversary against whom there is a job to be done, is not an easy task. Great credit must go to Marcos Freitas. Awaiting in the final is China’s Zheng Peifeng, the player who last week in Bulgaria had reached the quarter-final stage; his right handed pen-hold grip style of play, somewhat in the mode of the now retired Wang Hao, caused the downfall of England’s Liam Pitchford, likewise a player who had been required to compete in the two day qualification tournament. A four games to one outcome was the verdict (11-8, 11-7, 11-13, 11-5, 11-9). 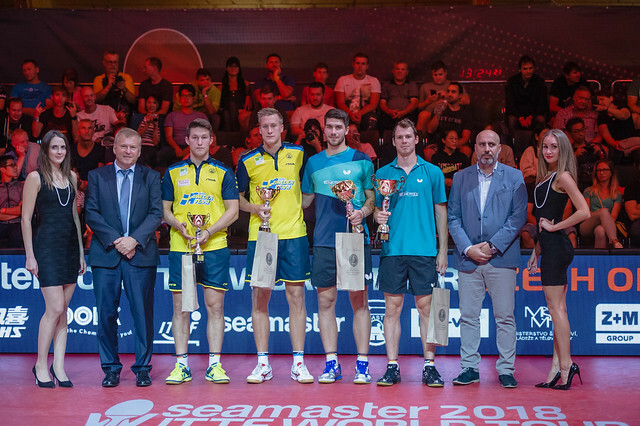 No doubt after beating Ma Long last week in Bulgaria and overcoming Zhang Yudong this week in the Czech Republic, the Chinese dossier on style extolled by Liam Pitchford is increasing. They are no doubt well aware of the Englishman’s potent backhand. The final will be played on the afternoon of Sunday 26th August.